The At-Home Pet Health Exam with Dr. Andrew Jones, DVM: 1 hour Video (MP4 format - Download). The At-Home Pet Health Exam with Dr. Andrew Jones, DVM is a 1 hour Video on how to perform a thorough, nose-to-tail health examination of your dog or cat. Basic price includes mp4 download only. To have it shipped to your door on DVD, simply check the box above (if you select DVD option, your order will include both the download as well as the DVD shipment). Knowing when your pet has a fever. Here is how to measure your pet's temperature, PLUS the thermometer that I recommend. Here is how to tell if your pet is not breathing normally. You will see exactly how to check respiration, and listen to your pet's lungs. Deciding if your dog or cat has an abnormal heart rate. In this part of the video I demonstrate how to take your pet's pulse - it's easy once you know how. Deciding when to treat your pet's infected eyes at home. You will see when it is appropriate to treat your pet's eye's at home, and when you should go to the vet. Finally, here is how to treat your pet's ear infections at home. In this part of the video you will see exactly how to instill my home remedies and clean infected ears. The truth behind the wet nose. You'll see how to check your dog or cat's nose, PLUS deciding if there is adequate air flow. At last, here is how to check for tooth and gum disease. I let you see inside of Lewis' mouth and show you how to check for signs of painful gingivitis. The lymph nodes are critical in deciding if your pet is sick. This section of the video you will see where the lymph nodes are located and how to check if they are enlarged. Deciding if your cat is hyperthyroid. I use Mischief, the hospital cat, to show you where the thyroid glands are located, and where you can so this in your own cat. Does your pet have allergies? The exact way to determine what type of skin condition your pet has. PLUS how to examine lumps and decide if they are serious or not. Knowing if your pet is blocked an unable to urinate. Here is how you can palpate your cat or dog and decide if they are obstructed. Sheath infections in male dogs and cats. This is common, and here is how to check for infections, PLUS the most effective ways to treat this at home. Your lame dog or cat. Here is how I systematically examine your pet to find out the exact location causing their lameness, and how you can do this at home. Back pain or injury in your pet. A step by step guide to checking for back spasm, or disc disease... PLUS knowing when you can manage this yourself or seek veterinary care. How to diagnose arthritis in your pet. 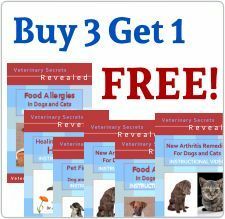 If you suspect arthritis in your pet, then you must watch this section so you can finally determine if that is the case. Your vomiting dog or cat. See in this section how to decide what the cause of the vomiting is, and the most effective forms of treatment. Diarrhea in your pet. In some cases it is safe to treat this with my at home remedies, while in other cases you need to see a veterinarian - I'll show you how to decide here. Is your pet dehydrated from vomiting or diarrhea? You can watch to see how I measure dehydration, and you can do this with your pet, deciding if they need additional fluids. If your dog or cat is coughing, then watch this. You'll see how I examine the coughing pet, make a tentative diagnosis, and the most effective remedies to treat it. How to check for a heart murmur at home. If you watch this part of the video, you will see how to listen to your pet's heart and decide if they need a workup for heart disease. Your dog may have tracheal collapse. Here is what you need to know in examining your pet's airway and how to check for this common condition. Deciding if your pet is in shock. Here are the exact things that you need to know to determine if your pet is seriously ill with shock. Your pet may be anemic- Can you tell? In this section of the video you will see how to check for the signs of anemia in dogs and cats. It's easy once you know how. Your pet's pulse is a critical measure of health. You must watch this video to know exactly how to do it - the best places to check, deciding if the pulse is too strong or too weak.